Despite this decline, jobs in physical industries are still more dangerous than office jobs. I say this as someone who respects the extra strain and danger faced by people who work in factories or hospitals, driving trucks or working on construction sites, or any other risky occupation. From that perspective, I want to assess the current level of occupational injuries and fatalities in the warehousing industry. Driven by the rise of ecommerce fulfillment centers–which are mainly classified by the government as warehouses–this industry shown tremendous growth in recent years, creating jobs for hundreds of thousands of workers without a college degree. These are “mixed cognitive-physical” jobs: They require both physical labor, and also the ability to work with technologically sophisticated equipment. One criticism of ecommerce fulfillment centers is that they are dangerous for workers. For example, we have all heard the story of how some workers in an Amazon fulfillment center in New Jersey were sent to the hospital after a can of bear mace fell off a shelf and discharged when a robot drive unit moved against it. Not a pretty picture! But our question here: How does the safety record of the warehousing industry–including ecommerce fulfillment centers–stack up overall? 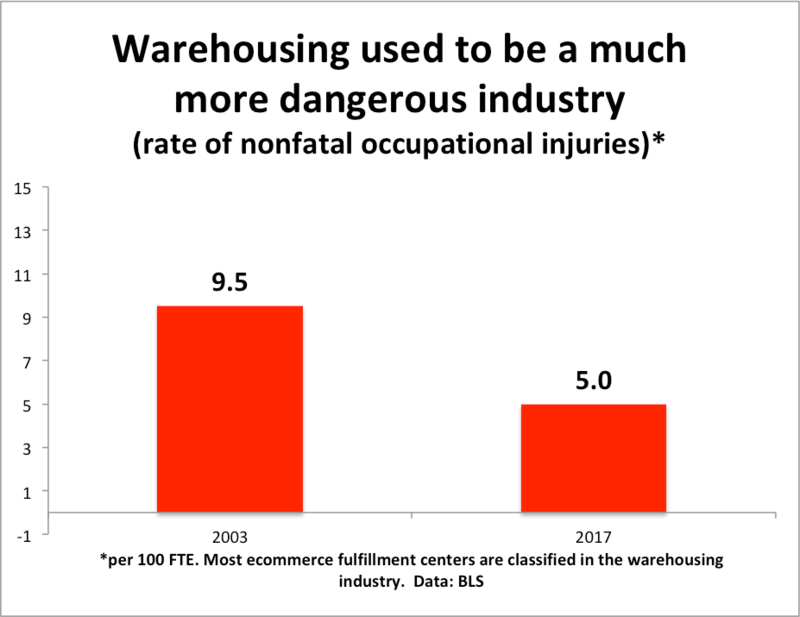 The first thing to note is that the rate of nonfatal occupational injuries in warehousing has fallen almost in half since 2003, going from 9.5 in 2003 to 5.0 in 2017 (per 100 FTE) (see chart below). The rate of nonfatal occupational injuries with lost days–a measure of the severity of the injury–has declined as well, going from 3.0 in 2003 to 1.8 in 2017 (once again, per 100 FTE) (not shown in chart). How does warehousing compare to other industries, in terms of safety? 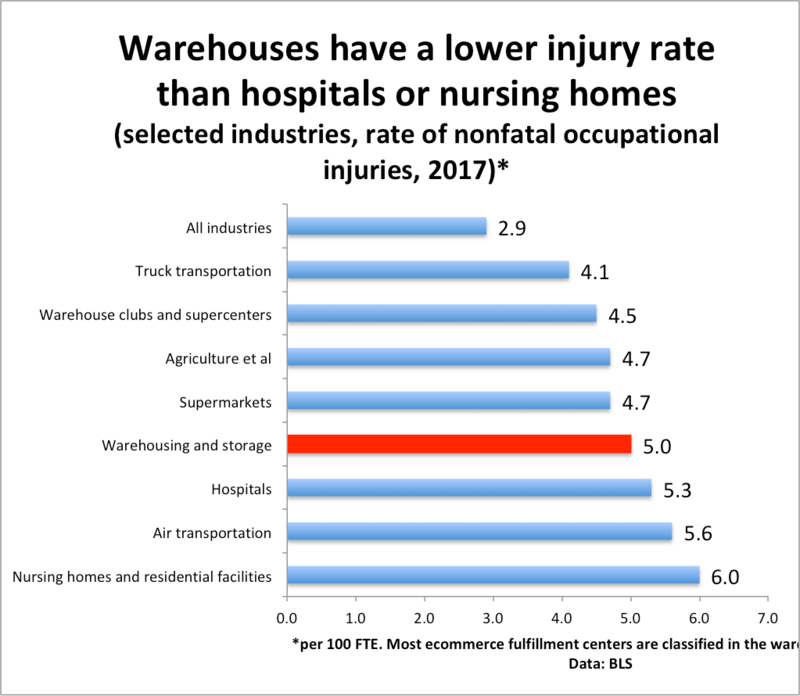 Warehousing has a somewhat higher injury rate than warehouse clubs, supermarkets, or agriculture, and somewhat lower than hospitals, nursing homes, and air transportation. Finally, we come to fatal occupational injuries. This is a small but obviously important category. All told in 2017 there were 22 fatal occupational injuries in warehousing, out of 5147 total occupational fatal injuries across the economy (construction, by comparison, had 971 fatalities). In 2006, warehousing had 17 fatal occupational injuries. The increase in fatalities, though, is purely reflective of the enormous growth of the industry. The fatality rate in warehousing fell from 4.9 in 2006 to 3.8 in 2017 (per 100,000 FTE). How does that compare to other industries? The chart below reports on occupational fatality rates for selected industries. We see that warehousing is slightly above average (the private sector had a fatality rate of 3.7). 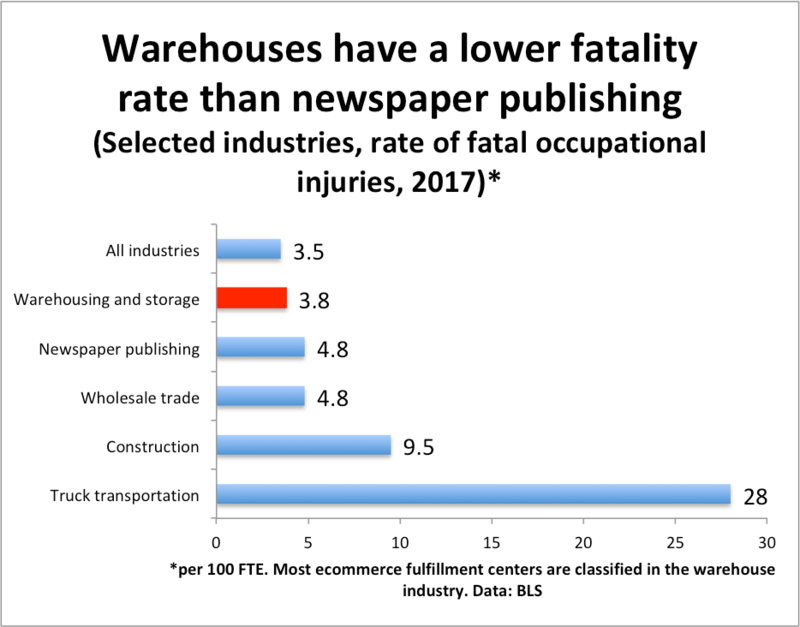 Interestingly, the fatality rate in warehousing is lower than newspaper publishing (4.8). Truck transportation had a stunning-high fatality rate of 28 (per 100,000 FTE). How we interpret the data: Like the economy overall, the safety record of the warehousing industry has gotten better, even as ecommerce fulfillment centers have become an increasingly large share of employment. And as we think about how to further improve the occupational safety performance of ecommerce fulfillment centers, they should be judged against other physical industries such as healthcare and trucking, rather than against office environments. *These statistics come from a BLS survey of employers. It’s clear that the survey undercounts injuries and illnesses, but the undercounts mostly seem to be concentrated among the smaller establishments. Research suggests that larger establishments (over 1000 workers) tended to be much less prone to undercounts. Moreover, the transportation/warehousing/utilities sector seems to have a relatively good track record for reporting occupational injuries and illnesses.